Apple released iPhone firmware 4.0 beta 3 today and then quickly pulled it back down. We haven’t heard if it’s back up yet but we have heard of some of the new features. First, when double clicking the homebutton and seeing the icons of the apps running in the background you can now swipe to the left and see new buttons. The first is a orientation lock. When it’s selected the iPhone locks it orientation to portrait and shows an indicator in the status bar. From what I can see in video demonstrations, it does not lock in the current position but always forces back to portrait. Hopefully this is changed in a later update and will lock in which ever way you had it when pressing that icon. I’ve upgraded to the new 4.0 firmware and there are some sweet new features. I’ve have a lot of apps because we test so many so the new folders feature is great. It would be nice if you could select one of your app icons in the folder as the main folder icon. Otherwise everyone’s iPhones will just look like a bunch of folders. MuscleNerd has posted a video on YouTube of veency running on iPhone firmware 4.0. veency is an VNC app which lets you see and control you’re iPhone from a computer. The video also shows the cydia icon, new dock, new calculator button and the new folders feature. Something you won’t find in stock 4.0…a VNC server :) Questions: http://twitter.com/musclenerd & http://blog.iphone-dev.org. PS: 4.0 BETAS are BUGGY! Don’t bother trying them if you’re not developing apps for them! View the Keynote HERE on Apple’s website. Below is a quick demo video of the new multitasking feature that will be available with the 4.0 firmware. Today, Apple announced firmware 4.0. The new firmware contains 100 new user features. Some of these new features include; the ability to create playlists, 5x digital zoom, tap to focus on video, gift apps, geotagging, places in the photo app, change the homescreen wallpaper, bluetooth keyboards, spell checker… etc. If those were not cool enough, the seven major new features include; multitasking, folders, enhanced mail, iBooks, enterprise, Game Center, and iAd (read more about those HERE). Today is the day (actually in just over an hour)! Apple is planning to make an announcement about the 4.0 firmware from it’s campus in Cupertino. The event will take place at 10:00am PT. Apple says we will be getting a, “sneak peek of the next generation of iPhone OS software.” We will have to see what this brings! 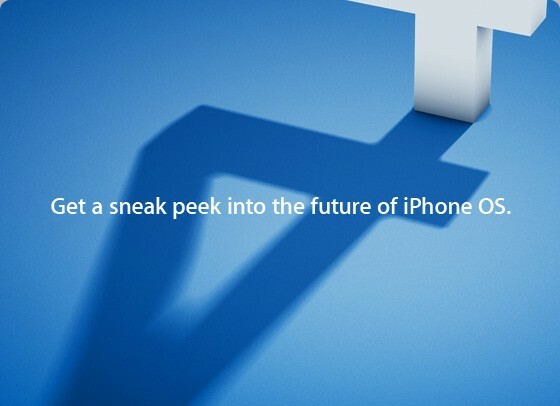 :) And, like usual, we will be live blogging the event… stay tuned! We’re inside. People are being seated. Anyone with a camera is being separated out for some reason. Seriously? So we’ll just be checking all our sources for info. Steve is on the stage. When there is real factual info about the iPhone, iPod touch, or iPad, we will be posting it here. An amazing stat being shared is Apple sold over 300,000 iPads on the first day and 450,000 as of today. 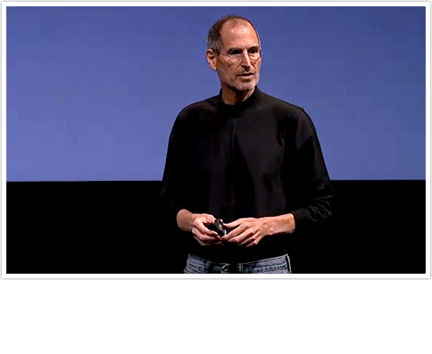 As usual, Steve Jobs is talking up stats, showing off some iPad apps, and showing they are a head of competition. 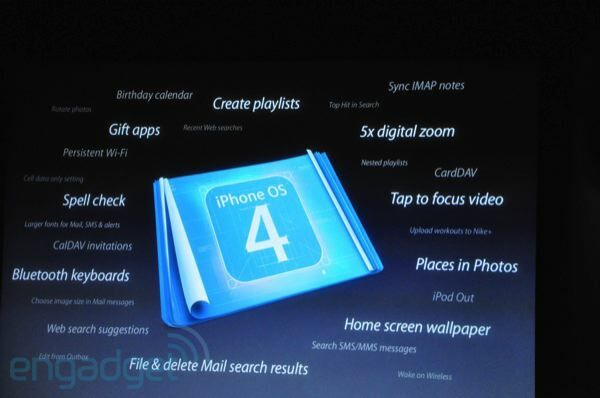 iPhone OS will ship in “Summer” of 2010 and a developer preview will be released today. There will be over 1500 new APIs, access to calendar, photo library, quicklook; new framework called accelerate for hardware accelerated math functions. iPhone Firmware 4.0 Event Preview This Thursday! Apple will be holding an event this Thursday, April 8th at 10:00am PT to show off the new 4.0 Firmware. One of the biggest features rumored to be announced is the ability to run applications in the background simultaneously. Additionally rumored is that hitting the home button twice will bring up an Exposé like view of the apps currently running. Instead of showing screenshots of current apps, it would show the icon of the apps. This would be one of the main features that competitor devices like Androids and the Palm Pre have. 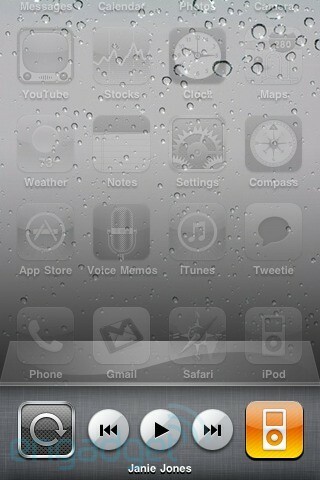 Of course, if you’re jailbroken, you can already do this with Backgrounder.